Creating a dedicated tablespace for your repository data can make it easier to backup and maintain your repository database. Given the fact that repository data has a footprint that is significantly smaller than that of your data warehouse, it is recommended to optimize your Oracle STORAGE parameters to minimize initial table size and minimize chained rows. When creating a production repository additional considerations should be taken to ensure that your backup strategy will allow you to always recover the repository data from a potential failure with full integrity. 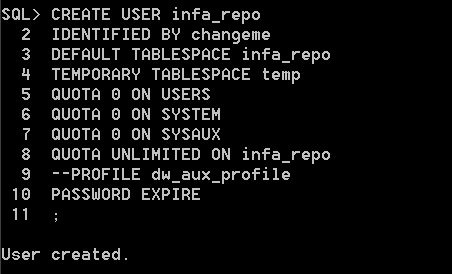 To help you get started I’m providing a template for a script that will create a user, a tablespace and grant basic permissions to your user, I’m using this configuration for my local test install.